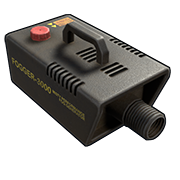 A Fog machine which runs on low grade fuel. Can be set to fill an area with a dense fog or triggered by motion. Creates a ((thick)) cloud of fog that can be used to conceal traps for a trap base, or just make your dwelling look somewhat ominous.